Improve your recruitment efforts by first understanding how your candidates are interacting with your content. How? Start using basic analytic tools such as Google Analytics or SmartLook. That way, you can learn how to measure the performance of your career pages, uncover how your candidates go through your job ads and to discover the most effective campaigns. 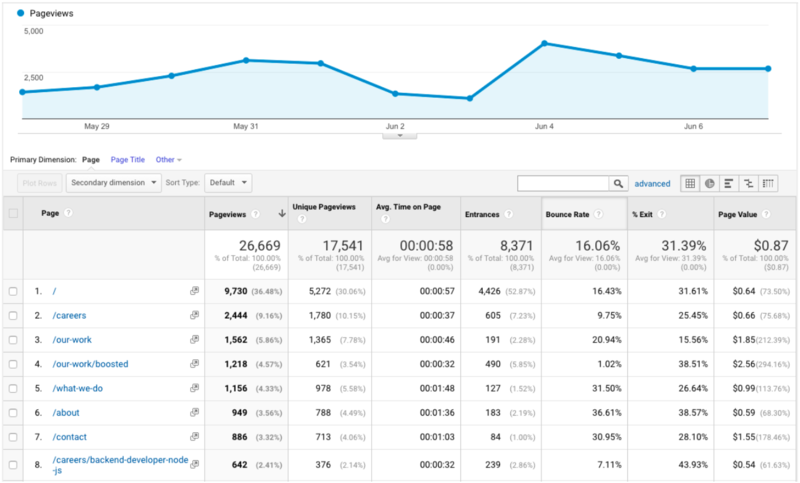 Google Analytics (GA) will be your best friend and the greatest tool to measure the traffic of who’s visiting on your website. I admit it can seem a bit complicated at first – but don’t be intimidated. Take advantage of these free courses to learn the basic metrics and to become a GA pro in no time. Once you accumulate some data to work with, you can filter through the visits on your career pages and compare the number of visits (pageviews) and the average time spent on each page. With this info, you can get an idea of what your visitors are most interested in. Also, pay attention to your bounce rate. Simply said, it’s a percentage of visitors who come to your page and leave without interacting or visiting other pages. If your bounce rate is below 50 – it’s a good thing. If the rate is above 70% it means visitors do not find the content attractive, relevant or worth further attention – and we want to pay attention to stay clear from that. Note: Check out the 3rd column – the average time spent on a page. People actually spend much less time reading websites than you think. In fact, people hardly read anything at all. It all comes down to scanning content and stopping if there’s anything on the page that’s worth stopping for. If not, they leave. It’s as simple as that. To quickly and easily get your message across the first time, use easy-to-read formatting, videos and pictures instead of long blocks of chunky text. Keep an eye on the sources of your traffic. Where are most of your visitors coming from –– is it through a Google search? A Facebook post? A paid campaign? This is crucial for managing your marketing efforts effectively. UTM tags are the pieces of code after the “?” character. You can learn more in this article or use the UTM builder. You see the first source is “direct” – meaning these are people who typed the address directly into the browser. The second is “Google search”. 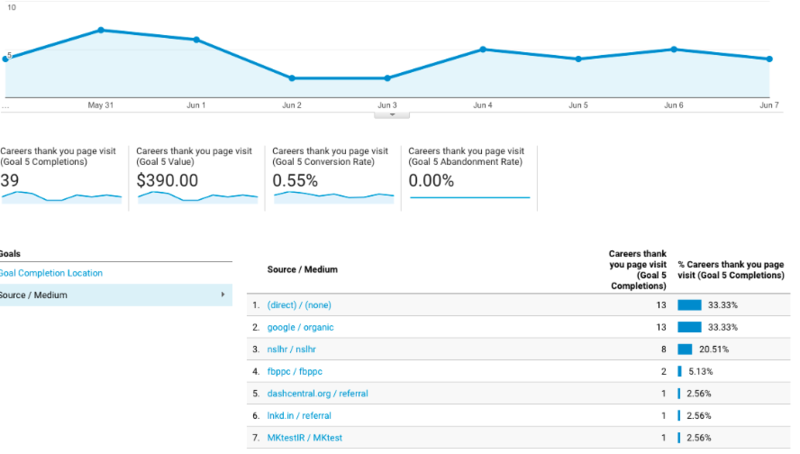 You can even analyze what keywords people were looking for in their search. It can be the company name, e.g. “Microsoft careers” or a job search “QA jobs Prague.” If it’s the second case, you can consider optimizing your website for search engines (SEO) to achieve better results or to launch an advertising campaign in Google search results (PPC). Who applied for the job? Traffic is one thing, but CVs are what matters most, so you still need to identify your visitors who applied for a job. Think about setting-up a Google Analytics Goal to identify all the people who made it to the final “thank you for applying” page. Note: The real reason why every e-shop has a “thank you” page after you complete your purchase is exactly this – identifying those who made a purchase. Thanks to conversion tracking, you can evaluate the most efficient campaigns, channels or sources to correctly target your efforts. In the example above, you can see this data: 39 people submitted the CV in the last week (Goal 5 completion) and it represents 0.55% of all visits of the career page. When it comes to sources of applicants, the first is direct access, the second is Google search and the third is through our regular newsletter (internal code “nslhr”) . When comparing the conversion-to-visits ratio we can see that the newsletter is our most efficient sourcing channel! Curious to know exactly how are people sniffing through your website? Luckily for you, there’s HotJar or SmartLook. (SmartLook has a free trial version). These tools record the exact behavior and movements of your visitors: how they move pointers, where they stop and read, when they scroll down. Below you’ll see the dashboard with all the recordings. A little stalkerish, but still. It gets the job done. You can see the list of recordings including the time they spent on your page, device (mobile, desktop), operating system and location. You can even analyze specific behaviors of the people who used a smartphone or desktop. Note: Turns out that mobile devices usually account for 50% of accesses, and in the specific case of Facebook campaigns –– it’s even more. However, the conversion rates are lower. It’s because filling a form on a mobile phone is quite painful. People give up and do not return. Experience shows that a form that’s too long can discourage 70% of applicants to complete it. To see the data aggregated from all users, use a heatmap. It gives you a useful picture on how people consume your job ads. Cool, huh? In this example of a job post for a backend developer, you can see that people mostly ignored the marketing crap and moved straight to the tech specifications. Note: People don’t like reading job ads. Keep it brief, 300 to 500 words max, avoid HR propaganda and go straight to the point. Some Applicant Tracking Systems provide some basic analytics too. Below is an example from Greenhouse. 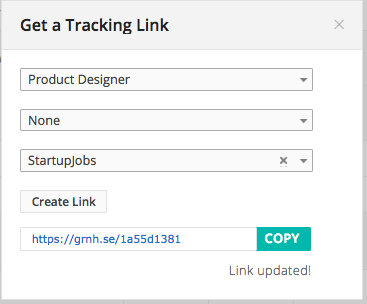 You can generate a link with special identification tags and include it in your postings on third party job boards. A great feature is when your ATS is integrated with several job boards and candidates are forwarded directly to your system with information about their source. With all the info right in your hands, measuring and reporting it is then very simple. Note: To be honest, in all my previous roles, reporting took a lot of time. I love Greenhouse for its possibility to create many different reports, its setup frequency and being able to send it all out to recipients t automatically by email.